GunBroker.com is pleased to introduce Version 5 of the website. With the introduction of Version 5 we will begin the restructuring of the site to a more responsive design that will create an easier, more uniform experience whether you are using a phone, tablet or your desktop computer. The first step in this process is the introduction of a new website Header and Footer and a brand new Home Page. The redesign focuses on moving things out of the way so your customers can get to your items easier. In the header Searching is more prominent. It is now Top and Center of every page. In the footer, things are expanded so everything can be seen at once. There is no more searching under each drop down to find what you are looking for. One of the best enhancements found in Version 5 of GunBroker.com is the site begins to respond to the device that is accessing it. 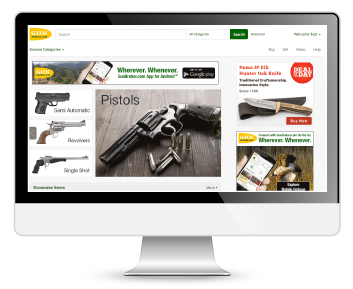 Regardless of the Smart Phone, Tablet or Computer being used GunBroker.com will present its content in an easily navigable fashion. On larger devices you see more of what you are used to: menus, links, fully displayed content. On smaller devices these items move into expandable menus, conveniently available when you need them but out of the way when you don’t. The initial Version 5 release focuses on Home Page rededesign, responsiveness and the inclusion of the new header and footer throughout the site. Other areas of the site to soon follow! The first thing you will notice is a more open layout that focuses on the content over section labels and text. This includes a cleaner, simpler header and the introduction of the Welcome Menu. The items you used to find under My GunBroker in the header are now part of your Welcome Menu. The Welcome Menu is your one-stop shop for your account related activites. You can directly access the My Account, My Buying, My Selling and Checkout sections of My GunBroker along with My Watch List, My Searches, My Support, Feedback and Shipping. When you come to GunBroker.com we welcome you and place everything you need to get started right there. Sign-In/Register can now be found on the right side of the header. Sign-Out can now be found at the bottom of the Welcome Menu dropdown. Sell Your Item has been relabeled as simply “Sell” located on the right side of the header near the Welcome Message. My GunBroker Items can be accessed via the Welcome Menu which displays when clicking or tapping the the Welcome Message. These are images of some of the website headers as a reference.